Formerly chesten nut, from Middle English chesteyne, chasteine, from Old French chastaigne, from Latin castanea, from Ancient Greek καστάνεια (kastáneia). 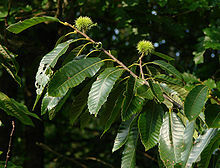 A tree or shrub of the genus Castanea. The nut of this tree or shrub. (uncountable) A dark, reddish-brown colour/color. (uncountable) The wood of a chestnut tree. (idiomatic) (Often "old chestnut") An old joke; a worn-out meme, phrase, ploy, etc. so often repeated as to have grown tiresome or ineffective. A round or oval horny plate found on the inner side of the leg of a horse or other animal, similar to a birthmark on a human. Of a deep reddish-brown colour, like that of a chestnut.